Le Lac Assal is part of the Tentative list of Djibouti in order to qualify for inclusion in the World Heritage List. Djibouti is not known in the world as a tourist destination, although it does not mean that there are no attractions. The country is small but fairly diverse, and has beaches, quite high mountains (with the highest peak exceeding 2000 meters above sea level), near which lies the lowest point of Africa (153 m below sea level) deserts, lakes and even a piece of forest (protected within the National Park Forêt du Day). As all of the countries in the Red Sea, there are also good diving spots. Djibouti has no WHS, although it is possible that this will soon change - the country wants to propose for the biggest tourist attraction - Lake Assal, which was my only trip outside the capital of Djibouti. The lake is just about 100 kilometers from the capital, but getting there is either complicated or expensive. Near the lake you can get cheaply by public transport (all buses towards Tadjourah), but from the bus stop to the lake there are still around 15 kilometers. Although the road to the lake is frequented, reports by other travelers indicate that it is not always possible to hitchhike. I wanted to choose this way to visit the lake, but after checking the temperature I gave up - it is Asal that is located in the lowest point of Africa and the temperatures at the beginning of May reach 40 degrees. You can go there as a tourist, although the Djiboutian agencies want $ 150 for such a pleasure. I managed to get a little cheaper - the host from the Chinatown hotel where I stayed, offered to take me there for $ 120. It does not change the fact that for such a small distance it was a strong exaggeration - but, well, Djibouti is not a cheap country. The road was mostly very good, although one had to watch out for holes in the surface that appeared from time to time. Along the way, we passed numerous examples of cooperation with China - through the railway line to various types of industrial plants. The Chinese take the matter seriously and, as they continue to do so, they will colonize Africa economically. Closer to the lake, the landscape changed to a slightly more mountainous and you could admire the views of quite considerable gaps. After almost two hours we arrived. While the heat in the capital was difficult to withstand, here, at several degrees more, I really tested my capabilities. I fear to think what it looks like in the hot season – it may be close to 50 degrees. No wonder there was virtually no one on the shore, except two or three souvenir sellers. There were also some children running around from the nearest village, and demanding nothing but water bottles for themselves and their parents. The lake itself is wonderful and deserves a place on the map of natural world class peculiarities. 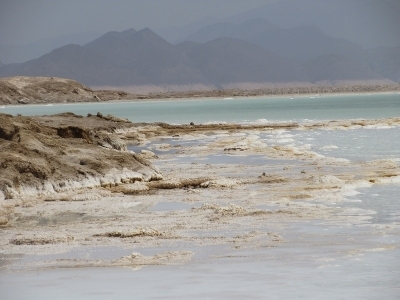 Asal is the most salty lake in the world outside Antarctica (the salinity is 348 per mille - for comparison, the Dead Sea has only 260 per mille). It is also the world's largest reservoir of salt, intensively exploited (which may be, by the way, the obstacle in winning WHS status). Only a few streams with fresh water flow into the lake. In the shallows the water was so hot that it was practically impossible to put a foot there.